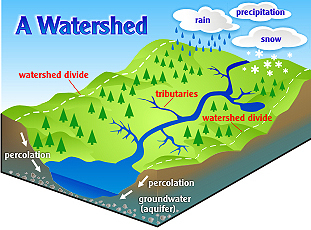 A watershed is a geographic area where all of the water that is under the land or drains off of the land flows to a specific water body (such as a river, lake, ocean etc). Everyone lives in a particular watershed! Watersheds include the plants, soil, animals, people and buildings that reside in each watershed that makes each one unique. Watersheds can cross township, county, state lines and national boundaries. What are the Watersheds in Berks County? 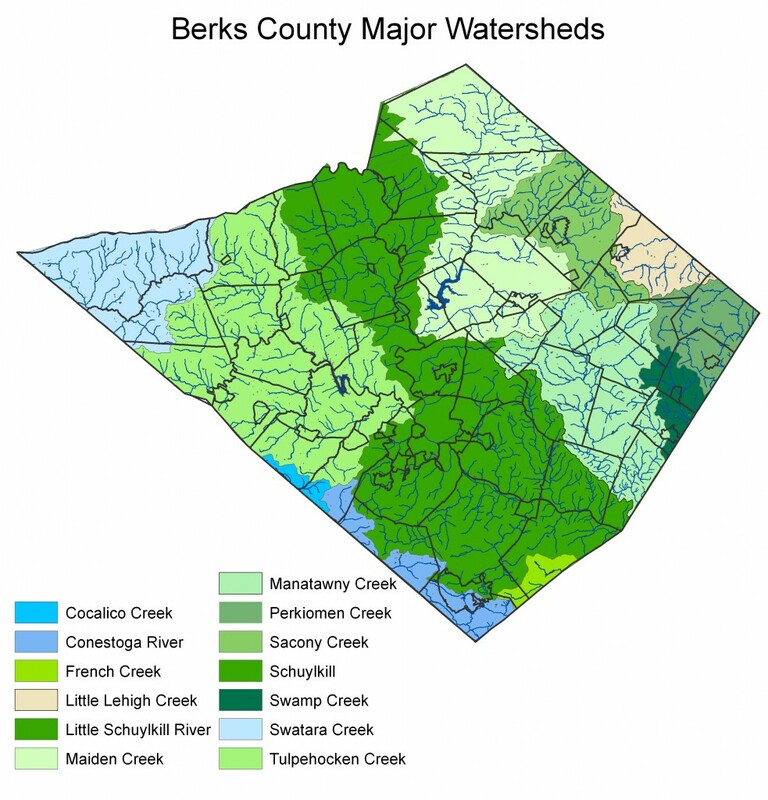 Berks County has three major watershed basins. 90% of Berks County drains to the Schuylkill River Watershed; 10% drains to Chesapeake Bay. The green Schuylkill River portion of our County flows down to Philadelphia and the Delaware River. What are the threats to the Watersheds in Berks County? The rainwater or snowmelt that runs across the land is called “stormwater.” When stormwater flows occur, they can pick up the litter, dirt/soil, gasoline, pesticides, fertilizers, and pet waste that we leave behind on the land and transport these materials directly into storm drains. The storm drains that carry the polluted water will empty directly into local rivers; they do not filter or clean the water before it drains into a nearby stream. Berks County’s streams and rivers have a high number of sediment and nutrients that are found in the water that originate from our activities on the land.